The last football game for the season was played on Sunday, and kudos to the Colts and Saints for putting on a great show in the Super Bowl. Canadian fans now count the days, as the next meaningful game for fans of professional football will be played North of the 49th when the CFL gets going in July 1st. Of course there is free agency fast approaching, and one player the Lions won’t have worry about signing is Ricky Foley. In a recent Vancouver Sun article, Mike Beamish reports that Foley is on the verge of signing a deal in the NFL. VANCOUVER — Ricky Foley flew in Monday from San Diego — and, boy, are his arms tired. The joke may be lame, but apparently Foley’s chances of signing with a National Football League team are not. Paul Sheehy, the representative for the B.C. Lions rush end, is confident that Foley will be offered an NFL contract by the end of this week. Foley is scheduled to work out with the Seattle Seahawks Tuesday following a session with the San Diego Chargers today. 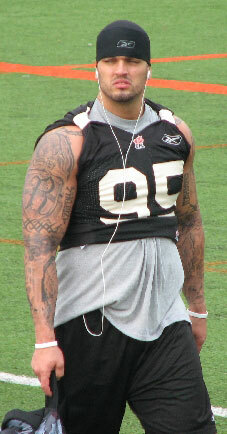 The CFL’s most outstanding Canadian in 2009 was at the training facilities of the New York Jets, St. Louis Rams and Philadelphia Eagles last week. This is a big blow for the Lions, who for the second straight season lose their top pass rusher, and a Canadian starter. CFL free agency season is getting less and less exciting. By the time free agency opens most of top talent has signed an NFL deal. Recruiting and free agent camps are going to become more and more important as more players are taking a chance to try their luck down south. The BC Lions are once again pleased to present the Orange Helmet Awards Dinner. It will be the seventh annual event, and will feature Darren Flutie who will emcee the event and his brother Doug who will be the keynote speaker. The awards were the brainchild of the late Bob Ackles, who’s commitment to minor league football was strong. The event goes Friday, April 9th at the Vancouver Convention Centre.